Your manager can be a mysterious person—one day they’re hot, the next they’re cold (cue Katy Perry). And chances are you’re desperate to do whatever it takes to make them like you more. I have the solution for you! Actually, I lied–I have five! Your boss has a lot on their plate. They don’t have time to handle everything, so they most likely delegate some of their responsibility to you. That’s par for the course. Look at this as your open invitation to run with it without needing their constant oversight and “friendly reminders.” I can almost guarantee they’ll be both impressed and relieved to see you taking charge in meetings, setting agendas, and completing assignments without having to ask. But when you’re not comfortable taking the lead on something, or are not sure how, or are struggling to handle the workload, your manager wants you to speak up. Most bosses aren’t evil, which means they don’t enjoy watching others suffer (at least I hope not). But more importantly, they need to know when you’re struggling because it may very well affect them. That deadline you’re about to miss, that project you’re half-assing because you don’t have enough time to spend on it—those results will negatively impact your boss’ to-do list as well their reputation. So, let them know when you’re lost (this template will help)—because then you (and your boss) can fix the problem before it happens. 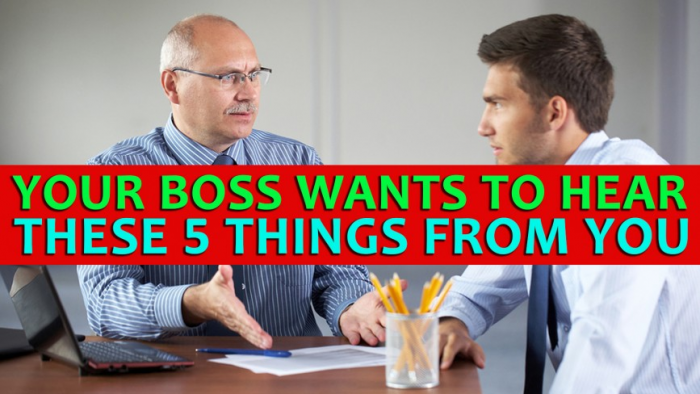 Your manager probably went over the general gist of what they expect from you when you first started your job, but they shouldn’t have to (and don’t really want to) continue to micromanage you to uphold basic work etiquette. Basically, even though they don’t say it, they really want you to show up to do your day-to-day job responsibilities, in addition to showing up to work on time, coming prepared to meetings, and meeting deadlines. And really, why wouldn’t you if you care about keeping your job? Your manager may not say this directly, but they want you to seek out information you don’t know or understand, question projects you’re involved in, and offer solutions. You’re there because they value your input, so don’t be scared to offer it. Trust me: They’d rather know there’s a flaw in their plan on day one, rather than day 100. [S]ometimes I’d just like my employees to do what I’ve asked. It’s exhausting (for both of us!) if I have to defend every single decision, plus it makes me feel like you have no faith in my judgment. If you’re still unsure whether it’s a good battle to pick, ask me. Say: ‘Are you open to a different opinion on this?’ and give me the choice of opening it up for discussion. Finally, your supervisor wants to be good at their job (again, because they’re not evil). Therefore, they want to help you do your best work, because realistically, it makes them look good, too. That means that they’re technically open to feedback. I say technically because in an ideal world, everyone you work with would want to improve and would seek out constructive criticism to make that happen. Alas, that’s not always the case. Or, if neither of those seems like the right tactic, you can try subtly managing up and, without having to say anything, train your boss to better manage you. As I said earlier, being proactive with your manager not only leads to more productive and effective collaboration, but tells them you can handle anything on your own—and possibly that you’re a great candidate for a promotion down the line.